In order to facilitate networking we are planning a variety of social events. These will include casual night-outs in Las Vegas, informal gatherings at the Brew Pub (Monte Carlo Resort), dinners at buffets etc. Despite a tight budget many of these events will provide free drinks & nibbles. However, you may be required you to buy your own lunch, dinner or drinks. Please see below for additional information. 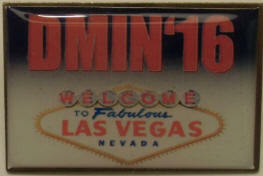 You will be provided with DMIN'16 lapel pins and loops (similar to the one above) to identify you as a DMIN'16 author, presenter or attendee. Please wear your pin during the conference and social events as it will grant you access to the socials. 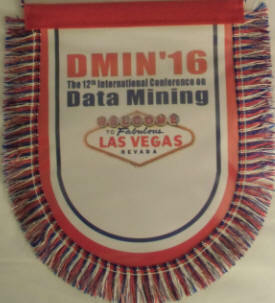 Also watch out for the DMIN'16 pennants (small flags, similar to the picture below). We will meet at 6:00pm at the Monte Carlo Bell Desk and take a Shuttle Bus or Taxis to the Rio. Free drinks will be provided.